When training pushes your limits, you need gear that works harder than you. Our mesh Helio Training Tank is crafted from super-soft, ultra-lightweight fabric that stretches in all directions to follow your every move, on mat, court or street. 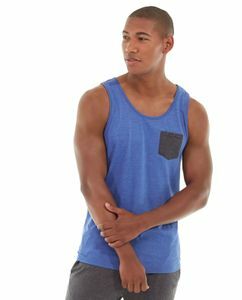 • Blue heather tank with gray pocket. • Contrast sides and back inserts. • Self-fabric binding at neck and armholes.